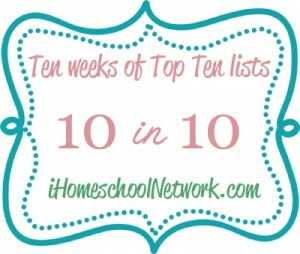 This post is part of the iHomeschool Network’s 10 in 10 link up. Today’s topic is top 10 reasons I chose my particular homeschool method. When I was in college I had to compose my own philosophy of education. I was a total idealist. I wrote about reading the Great Books, memorization, Latin and Greek studies, and so on. When reality hit, I found that I did not have the stomach for such rigorous learning. And our life abroad also didn’t mesh with the highly structured classical system. CM was a gentler but still traditional style of education that I could successfully implement. Here is an admission that I’ve never offered here on the blog. If I had it to do over again, I think I might become an unschooler. In the beginning, I had some terrible misconceptions about what unschoolers are. I thought you literally allowed (encouraged!) your child to play video games all day long. Now that I know more about it, I see that I have a lot of unschooling, or delight directed, tendencies. But when I was deciding on the direction of our homeschool, CM offered a “safer” framework, one that didn’t seem as wild as unschooling. So when you take reasons 1 and 2 together, you can see that in my mind, CM was a middle ground that I could accept. 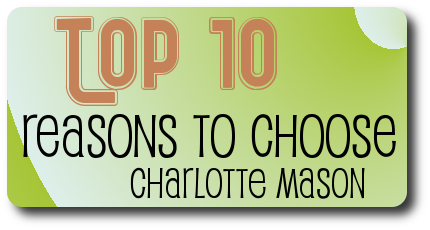 Charlotte Mason can be adhered to in a purist sense, but not many homeschoolers do that. Instead, they pick and choose the elements of CM that suit them and go eclectic on the other parts. I don’t know if all homeschool methods lend themselves to eclectic approaches, but CM certainly does. I am too much of an independent thinker to be sold out 100% to any single educational philosophy. CM provides a foundation and lets me branch out from there and be a bit eclectic. Charlotte Mason used living books as the main vehicle of delivering ideas to children. As a lover of books and a skeptic of textbooks and twaddle, CM’s ideas greatly appealed to me. Because living books are the foundation of a CM education, it is a frugal homeschool option if you have access to a library. Even if you do not, many excellent books are available for free in the public domain. Of course, to best use public domain books you need an eReader of some type — a Kindle, Nook, or iPad. Now more than ever a frugal education is important to me, and CM offers that. You already know that my daughter is a very creative child. Charlotte Mason’s emphasis on the fine arts is a perfect fit for her and exposes her to beauty that she can emulate in her own creations. As a homeschool mom, having the opportunity to study artists and composers is a real perk to me since I studied only the tiniest amount in college and never before. I am a nature gal. I love the outdoors, wild places, and wooded parks. I believe that God’s very character is expressed in the natural world, and therefore, we have an obligation to enjoy nature and see God’s glory in it. Charlotte Mason firmly believed in giving children unstructured time outside where they could exercise and observe natural science first hand. Shakespeare, the Bible, and other classics of English literature are important in the CM scheme of things and are not limited to high school years. I have a great appreciation for modern literature, but not to the exclusion of the timeless works of the past. So although CM doesn’t emphasize the classics as strictly as a classical education does, there is still a healthy foundation there that I can approve of. I am not a huge lover of poetry, but I never wanted to prejudice my daughter against it. So, according to Miss Mason’s suggestions, we did regular poetry study from the very early grades. And it worked. My daughter enjoys and appreciates poetry far more than I do. Narration is so essential to a CM education that I would go so far to say that if you are not narrating, you cannot call yourself a CM educator. But what I love most about narration is that it can be done in varied ways. When Sprite was young, we often used lapbooking as a method of narration. Over the years, we have slowly moved over to an almost exclusive use of notebooking. In notebooking, she is learning an academic subject but is also practicing writing at the same time. If you are a CM educator, I’d love to hear your reasons. Were you like me? Was choosing CM actually a refusal of other more extreme philosophies? I am just sort of an eclectic homeschooler, like you was afraid of full on Classical and Unschooling. I wanted structure with flexability to bring in the books, topics etc. that I liked etc.. I call it the “take out menu” approach to homeschooling, I take the things that appeal to and work for us from the different columns and styles of homeschooling. From learning CM style from you I have done a bit more with Lapbooks/Notebooking which I didn’t know much about when I started. My daughter is similar to Sprite in being a good reader, fair writer and loving the arts. My son, two years younger is a slow and reluctant reader and writer, prefers science to the arts etc. So I find my self needing to do different sorts of things with him and at a different pace to help him grow and engage in his learning process. I guess what I am saying is one size doesn’t always fit all easily and I am wondering how others handle living books and notebooking issues with a child like my son for whom they are a real struggle and not a joy. I am/was afraid if Classical. I personally chafe against rigid rules and structure, so the “not gonna follow the rules because I don’t wanna ” in me knew better than to go that route. I know I am lazy enough to not do a good job of total unschooling. My eldest is creative so her creative outlets are interest led. I am also an avid book lover so the whole literature based idea of Charlotte Mason thrilled my verbal soul. I do know that my girls respond to living books with a passion not found in other types of learning. So I guess we are eclectic Charlotte Mason style simply because it works for both Mama and kids. I think I’m going to stop labeling my homeschool and just do whatever I feel like doing. I’ve gone through classical, un, relaxed traditional, and I’ve concluded that what my kids need, now and always, is Mama doing whatever they need done. Right now, I think that’s probably going to be CM! But if all that nature stuff and arts stuff (we are rather uncultured, so who knows how that will go?) doesn’t work out, I’ll be happy to toss it aside and do whatever comes next. You have always been an inspiration to me in sticking to and enhancing our mostly CM method. Like you, I thought the idea of classical education was great in theory (& I have a cousin who loves it) but in practice, I just couldn’t bring myself to do it. And I have been learning more about (& even experiencing a bit of unplanned) unschooling and love the idea but I don’t think I could ever be 100% unschool. Yes, Jimmie, choosing CM was a refusal over classical as presented in TWTM. When I first began researching hs’ing, I was drawn to TWTM. But in actuality, I found it to be too rigorous for my first and second-graders. We quickly switched to a more CM approach. Unfortunately, our busy schedule does not allow for a complete CM education. Now our hs is a mix of CM, a few TWTM components, a couple of workbooks the girls enjoy, and online resources. I get the ‘too scared’ part, but never imagined you would say that! Love that we can pull from various methods to meet the needs/strengths and weaknesses of our children! Ha! Love it! Unschooling is “wild” because it is so far out of there in terms of thinking about education in our society. I actually don’t like the word unschooling, because it is defined in so many ways. There are unschoolers that allow their kids to play video games all day- and more power to them. Their kids still get what they need. I think the *key* is the family dynamic. The parents set the tone for democratic, peaceful relations and they open the world to their kids. How that works out in application is unique to every situation. We will turn you over to the “wild” side yet Jimmie! For me, eclectic homeschooling that takes my daughter’s interests into account is my middle ground. If I were braver, I would unschool but then my organization obsessed self would probably never be completely comfortable with that either. I have no idea what we are!!! I love and use some of the Charlotte Mason concepts and there was a time about five years ago when I would have said we were almost unschoolers, but my youngest five kids seem to need some structure, so now I guess I would say we are eclectic. It sounds like this is working really well for you. I don’t know that classical has to be all scary and rigid, especially in he early years. Classical does not have to be The Well-Trained Mind way. The Bluedorn’s Trivium Pursuit website has some good articles on this – I especially like the ten things to do series. My current favourite for a friendly non-regimented take on classical education is Diane Lockman’s Classical Scholar site. Her roadmaps to mastery are great tool. If I have to pick a label it is Classically Eclectic/Eclectially Classical – a carefully constructed blend of classical, CM, unschooling, unit studies, tidal schooling, notebooking and TJEd, developed over more than 15 years experience (I still can’t believe it has been that long)! Wow, I am excited to hear you say that unschooling appeals to you in some aspects. A couple of months ago I “came out” with the same statement on my blog. Unschooling really appeals to me more and more but I prefer to call us more of a very relaxed homeschooling family. Lots going on all the time even this summer in the form of camps, art, reading, etc. Most of those reasons fit me as well. I wanted to be an unschooling momma at first, but it did not work out well for me. So we lean more to CM style things, while having the freedom to break away from the schedule to explore an interest. Love your list and reasons!! Fantastic and interesting post. I absolutely love living books. Unfortunately where we live right now, we don’t have much opportunity for nature studies, but will hopefully be moving soon to a more agreeble place! You describe points which reflect many of my choices and fears. A Charlotte Mason approach is dynamic. As I re-read CM principles I realize that we can constantly upgrade ~ as my children mature and as I take courage to “keep out of the way” and encourage my children to connect with great thoughts, great minds, great art. I don’t know many curricula that is so deep, so wide and so challenging, yet utterly “do-able”. I loved this list and could relate with nearly all of your points! I am going to share it with my readers! Thank you! Well unschooling really just meant not school or taking your kids out of school. He used homeschooling and unschooling interchangeably as he didn’t really know a term to define home education at the time. The thing about Charlotte Mason is she didn’t use the same book list every year. She would include new books etc. Great reasons, it’s just as I had wrote this! ha ha. To be honest, I’ve practice unschooling with my kids but I think it’s not for everybody, it didn’t completely worked for me. I know they learn lot of things but I find CM method to be the ideal balance I wanted for them.